The Lenovo-owned company took the curtains off the Moto G6, Moto G6 Plus and Moto G6 Play. The devices fall in the mid-range category in terms of prices. Motorola finally unveiled its three mid-range smartphones. The Lenovo-owned company took the curtains off the Moto G6, Moto G6 Plus and Moto G6 Play. The devices fall in the mid-range category in terms of prices. The phones were launched in Sao Paolo Brazil and are already available on sale in the country. So far, there has been no word on the device's availability here in India. The Moto G6 Play launched at a price of $199 (Roughly Rs 13,000).The Moto G6 Plus is priced much higher than its previous generation counterpart; the Moto G6 Plus is available at $370(Roughly translates to Rs 24,350). The Moto G6 comes with a competitive price tag of $249 (Roughly Rs 16,000). The Moto G6 comes with a 5.7-inch screen that comes with an aspect ratio of 18: 9. The screen is a FullHD+ IPS display that yields a pixel density of 424ppi. The company claims the display is protected by a Corning Gorilla Glass 3. The device is powered by Snapdragon 450. The processor will either be coupled with 3GB RAM or 4GB RAM. For storage, Motorola is providing 32GB of internal storage which can be expanded using a MicroSD card. Coming to the optics, the device comes with a dual lens setup with one 12megapixel sensor coupled with another 5megapixel sensor. The front camera houses a 5megapixel sensor. A 3,000mAh battery powers the device. Surprisingly, the Moto G6 Plus is the most expensive of the lot. The device is powered by a Snapdragon 630 and comes coupled with 4GB of RAM. The smartphone will be available with 64GB of internal storage which can be expanded further using a MicroSD card slot. The device features a slightly bigger 5.93-inch screen when compared to the Moto G6. However, the smartphone still comes with FullHD+ resolution and an 18:9 aspect ratio. 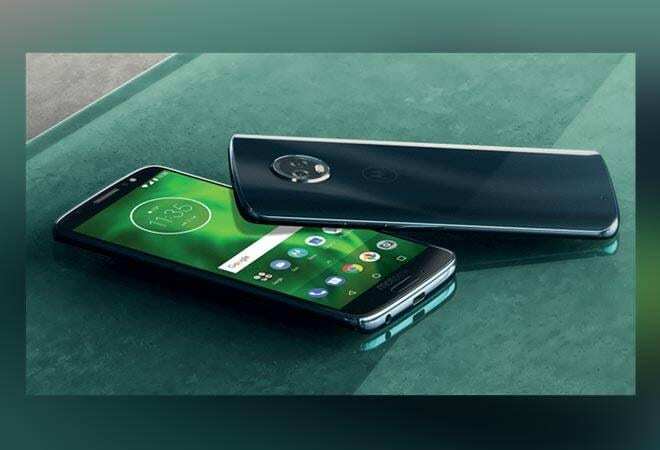 The device comes with Android Oreo out of the box and is expected to receive the Android P.
The primary camera setup of the Moto G6 Plus looks similar to that of the Moto G6. The device has one 12megapixel sensor and the other module houses a 5megapixel sensor. The front camera houses an 8meagapixel sensor. A 3,200mAh battery will power the smartphone. The device comes with a USB Type-C port along with support for NFC and Bluetooth 5.0. The Moto G6 Play comes with mild specifications but a mammoth battery with a capacity of 4000mAh. The device has a Qualcomm Snapdragon 427 chipset that will either be coupled with 2GB or 3GB RAM. The Moto G6 Play gets 32GB of internal storage that can be expanded via a MicroSD card. The Moto G6 Play has a 5.7-inch display with an aspect ratio of 18:9 and HD resolution. In the camera department, Motorola has placed a single 13megapixel primary camera. The front-facing camera houses an 8megapixel sensor. The device also features a USB Type-C port.